The Waste King L-2600 sounds too good to be true because of its fascinating array of features, but it is definitely the real deal. What more can we look for from a disposer that seems to have it all? If we were to guess where Waste King Garbage Disposal got its name from, we would say it might have had something to do with their ability to create products that are truly high quality, to the point where they can potentially please the royal family. What kind of service could a garbage disposal unit possibly provide in order to reach this unbelievable level of performance? Well, for starters, it could bombard you with an array of beneficial factors. This is a strategy that the Waste King L-2600 Legend Series Garbage Disposal knows all too well. On this review we will get to familiarize ourselves with all the great things that make this disposer stand out, so that you can assess on whether to spend money on it or not. Let’s start this off by saying it is a heavy duty model that makes use of a 1/2 HP permanent magnet motor. That’s the most basic ability that this unit has: the power to grind up the tougher bits of food waste that 1/3 HP models could not. Even when compared to other 1/2 HP units, this one can truly stand for itself. It boasts a fast grinding action that reaches a speed of 2,600 RPM, allowing for a more efficient shredding action. This is more impressive because of the fact that other units could not even reach 2,000 RPM. Take note that the Waste King L-2600 is a continuous-feed disposer, which means you can add waste while the unit runs, making the whole process less demanding. In addition to its impressive performance, it also boasts an array of other helpful features that boost its appeal such as a removable splash guard, a seal stopper, a stainless steel grind ring, and swivel impellers. The impellers are there to reduce jamming, while the removable splash guard helps you keep everything clean. Furthermore, the front-mounted reset button allows for simple operation. All of these functions make this Waste King L-2600 sound complicated, but it’s actually not. In fact, it is very easy to install, thanks to the mount system that reduces the time you have to spend just figuring out how to hook it up with your sink. Conveniently, it already comes with a 36-inch power cord. There is a reason why this Waste King L-2600 has been getting nothing but praise from reviewers all over the globe. If those features above weren’t impressive enough, this model has a few more tricks up its sleeve to convince you to spend your hard-earned money on it. For example, despite its above average strength, it maintains a space saving design that makes it compact enough to fit right under your sink. 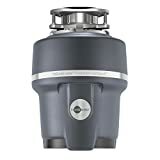 If you are using a septic system, this Waste King L-2600 disposer can possibly be compatible with it, so long as it is in the proper size. For a second there, you might have thought that all these benefits couldn’t possibly come cheap, but then you would have been wrong. In fact, this currently costs a little under $70 dollars.